Have you ever wondered why life seems to stagnant when it comes to achieving goals and you’re not progressing? Maybe you are too comfortable in your day-to-day. Ever stopped to think what would happen if you took a little baby step outside of what feels comfortable? When you think about the goals you have set for yourself, do they seem super far away and hard to actually reach? I know for me, some of the goals I have for myself seem so far off. And I also feel like they will cause me to have to make some huge strides in order to get there, and that’s really scary. For example, one of my goals is to have a fully functioning business that will be able to pull my weight in my family financially. That seems VERY far off. And all the little steps from here to there really add up and start to overwhelm me. Another example is to be as physically fit as I can be. Again, it’s going to take a lot of dedication and hardship to actually get there. The idea of finally getting there seems forever away. Or maybe for you, you have dreams of becoming a CEO of a company, but some of the things you’ll have to do in order to achieve that is to manage many people under you, have a business plan, confront your fears of public speaking, and a whole other host of tasks that are way out of your comfort zone. Thinking of all these things that scare you make this goal of yours seem unattainable and too far from reality. Our comfort zone. This is where we hang out all the time. Most of us just stay comfortable doing the same things. Going to the same places. Keeping the same schedule. Talking to the same people. Basically just doing the same thing over and over again. Yet, we expect our goals to just happen while we stay in our comfort zone. We expect that somehow the stars will align while we just hang out in our comfy PJ’s and Boom! A goal is reached. We must break free. There is so much success outside of that comfort zone. Do you know why you’ve never reached those goals of yours? Because you’ve never taken the right steps necessary to get there. That’s all there is to it. You simply have not opened that door that takes you outside of your comfort zone that will help you to begin achieving goals. The awesome thing is that you don’t have to take a huge leap. All you have to do is take little baby steps. Maybe in addition to walking every day like you have been doing, you decide to jog for 30 seconds. That’s it. It was uncomfortable, I’m sure. But the awesome thing is the more you keep running those 30 seconds every day, the more those 30 seconds of running will become a part of your comfort zone! See what happened there. 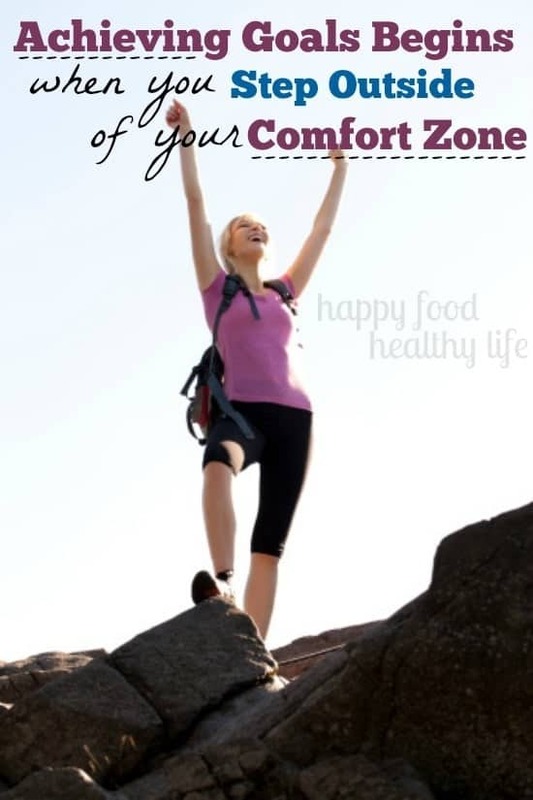 Your comfort zone expanded! If you go back and look at the little picture I drew, your goal seemed so far away from where you were, right? Well, look what happens when you start expanding your comfort zone. 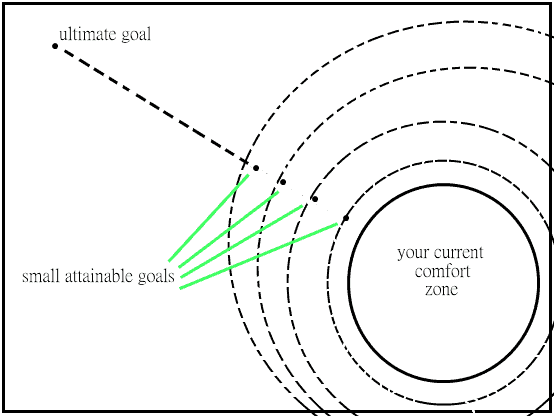 Once you start making and reaching your small attainable goals, your comfort zone starts to become larger and larger. You are then able to achieve more in your daily life. And you are so much closer to your ultimate goal! I was actually able to apply this platform to my eating disorder recovery. For me to say that I wanted to achieve the ultimate goal of recovery was so huge and overwhelming. So instead, I started with a small goal that was easily attainable. I set myself a place at the dinner table. That was something I could do. I did that until it was comfortable. Then I added something else like going to the gym and getting a healthy dose of exercise. I kept going until that felt comfortable. I started doing these two things so often that it just become part of my normal life, and I was that much closer to my ultimate goal of recovery from disordered eating. I never went out and said, “I am going to resolve to recover from my eating disorder.” But I knew what steps I needed to take in order to get there. A little bit of therapy, a little bit of adding meals to my day, a little bit of gym time, and a few other things. Not one bit of it was comfortable. I had to get out of my comfort zone in order to make amazing things happen. I was eventually able to reach my ultimate goal. 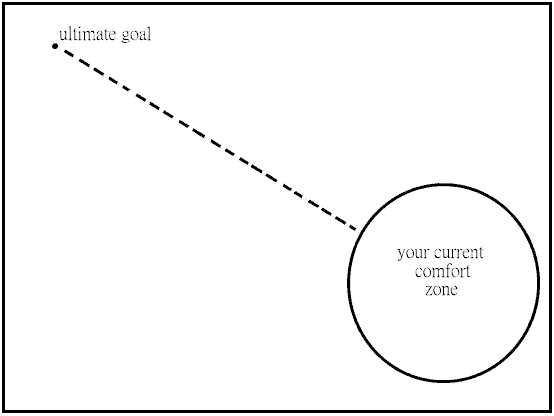 There are still time I have to step outside my comfort zone in order to maintain my goals, but it’s not nearly as difficult as it used to be because my comfort zone is now larger and encompasses more. I am so glad you found encouragement in this post. I hope you are doing well, my friend. Completely agree, Holly! We can except difference results when we do the same things. Here’s to stepping outside my comfort zone. It so totally will. I hope that one day my fear of public speaking is overcome with this sort of practice. I both dread and welcome it haha!